Windsor Grade 1 Slate - Chinese Roof Slate Prices. Windsor Grade 1 Roof Slate are all made Imperial Sized, to match Traditional Welsh Slate Sizes. Windsor Grade 1 Natural Roof Slate Quality Chinese Slate. Every Slate Checked, Graded, and Guaranteed 75 Years. 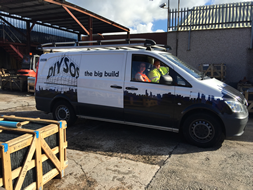 All Slate Prices are Collected Prices from our Depot in Ashton - Under - Lyne ( Manchester ) and + VAT. 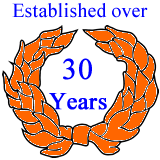 Family run business with over 25 Years experience supplying Chinese Roof Slates. The Bitterness of Poor Quality Slates, Remains long after the Sweetness of Low Prices. It has been frequently said that the Windsor Grade 1 Chinese Roofing Slate is comparable in all aspects to Welsh Slate, its appearance is almost identical to a Welsh Slate, and in a short time resembles that of a Second Hand Slate, and costing a lot less ££££. The Colour of slate: Is determined by the chemical and mineralogical composition of the slate being quarried. 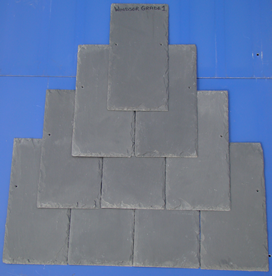 Since these factors differ in various localities, it is possible to obtain slates in a variety of colours and shades. All Slates will weather to a degree and after time will show a surface difference in the Colour tones. When the change is slight, the Colour is classified as permanent or “unfading”. If the final results are more evident, the colours are classified as weathering or fading. This is why Roofslates.com will not Cover or Guarantee against colour change or fading of any Slate. Only the best quality roofing slates supplied, at the best slate prices. Quality is key to us here at Roof Slates, allowing us to guarantee that all our customers are only supplied with the Highest Quality Roof Slates. We only stock the best quality roof slates. Colour matching service provided on roof slates. 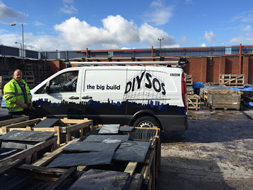 Specialists in supplying large quantities of slates. All reclaimed slates sorted and graded. Worldwide shipping available on all roof slates. Wastage when fixing the slates depends on many factors i.e. the complexity of the project, ( valley cuts, skylights etc) and the experience of the Roofer. 12,000 - 24 x 14 reclaimed welsh slate supplied for Coronation Streets new set. 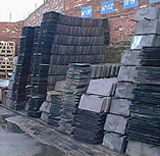 Roof slates is one of the largest supplier of reclaimed welsh slate in the uk. Click below for All Roof Slate Prices. The Bitterness of Poor Quality Chinese Slates, Remains long after the Sweetness of Low Prices.